"It’s music, but not as we know it, Jim"
That could have been the sub-title of the talk about ringing that I gave to a room full of appreciative musicians, but I didn’t think of it at the time. The occasion was the annual meeting of the Southeast Region of Making Music (which used to call itself more descriptively the National Federation of Music Societies). There is normally a lecture and/or recital after the business meeting, and this year I was asked to stand in at short notice to talk about the musical aspects of bellringing. Of course that was an offer not to be refused (in fact no offer to talk to non-ringers about ringing should be refused). The material I have used many times before when talking to community groups and schools includes a section on music, but only a light weight bit to whet their appetites among all the pictures. With a room full of serious musicians, I decided that music should be the main theme of the talk. To make space within the available time, I removed a lot of the historical material about the development of full circle ringing, pictures of a bell restoration project and so on. In its place, I said much more about the sound of bells and how they are tuned, and how changes and methods work. I went on to compare the performance skills needed by ringers compared to other musicians, and the musical aspects of methods and composition. To put the audience in a ‘music but not as we know it’ frame of mind, I began “Can you imagine: an instrument whose moving parts weigh a ton or so, an instrument with a delay of over a second between your action and its sound, playing an ensemble of such instruments to a precision of a few hundredths of a second, a form of music constrained to play every note before repeating any of them, composing a piece to last several hours in which no bar must be the same as any other, performing such a piece without any music? If you can, then you can begin to imagine change ringing on tower bells”. 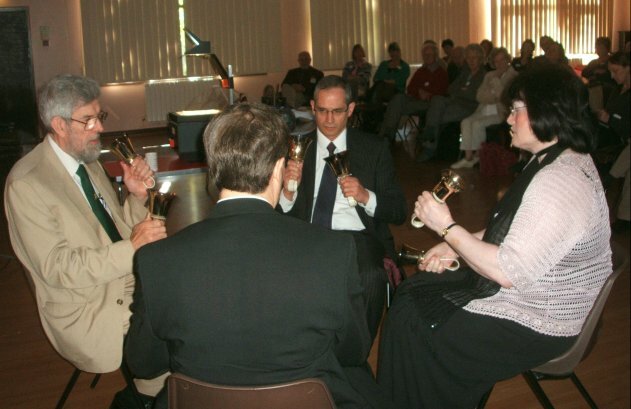 As well as the usual models, pictures and recordings, I included two handbell performances, in which I was joined by Marcia Dieppe, Chris Cole and Neil Curnow. The first was a course of Plain Bob Major to illustrate the general feel of change ringing music, and demonstrate the periodic appearance or roll ups. The second was three leads of Kent Major to show how not only the method, but also the composition can concentrate roll ups more densely into a performance. As an added interest, we rang the first touch on American bells and the second on more traditional English bells, to show the different styles of tuning. I had been told that I could talk for the whole hour allotted, because there wouldn’t be many questions. How wrong that prediction was. Despite lunch being next on the agenda, the audience of around 30 people produced question after question, until eventually the chairman drew things to a halt, though questions continued over lunch. I always find non-ringers are fascinated when they discover how much there is to ringing, but I wasn’t sure how a group of serious musicians would react. In the event, their interest and enthusiasm proved to be even greater. Published in The Ringing World , 31 October 2008 See the series of articles I was asked to write afterwards.